The birth of William Shakespeare 450 years ago will be celebrated in style in his home town of Stratford-upon-Avon in April – and across the world. Many thousands of visitors from around the globe are expected in Stratford for the bumper weekend of family fun on April 26/27, which will also include plenty of pageantry, pomp and performance. 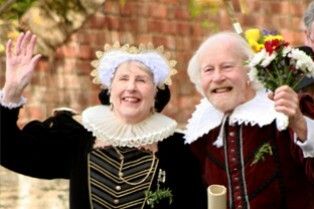 Jubilant flag-waving crowds will line the streets of the Elizabethan market town as actors, foreign diplomats and civic dignitaries join a 1,000-strong grand Birthday Procession through the streets on Saturday April 26 as the town – and the world – pays tribute to Britain’s most famous playwright and poet. This will be followed by a community parade where locals and spectators can join the throng of costumed players, musicians and creative groups celebrating this milestone anniversary. Shakespeare was both born (1564) and died (1616) in Stratford on the same date – April 23, the day the country also celebrates its patron saint, St George. Since 1893, the boys of Shakespeare’s old grammar school King Edward VI School (K.E.S.) have led the procession to HolyTrinityChurch, and make a memorable spectacle as they parade through Bridge Street following the traditional unfurling of the flags of nations ceremony at 11.00am. Once the procession is in position, the flag unfurling ceremony and the ‘Quill Pageant’ will take place. This is where costume character William Shakespeare ceremoniously hands over ‘The Quill’ to the head boy of K.E.S. who will use it to signal the start of the flag unfurling ceremony and will then carry it all the way to Holy Trinity Church, symbolising Shakespeare’s journey from the cradle to the grave. Immediately following the main parade will be the Community Pageant and street entertainers, with the Stratford Morris Men bringing up the rear. Local people and visitors are invited to walk with the Pageant through the town. In addition, The Royal Shakespeare Company will be running a range of free activities for all the family in and around its theatres on Saturday 26 April, including storytelling sessions, stage fighting workshops and the chance to see how fake scars and bruises are created. Visitors will also be able to enjoy music in the foyer areas, and, for 50p, cross the river on the ferry listening to RSC actors reading sonnets. The RSC is also working with community artist Georgia Jacob and organisations based in Stratford-upon-Avon to produce an exciting addition to the community element of the Birthday procession. Each group will produce a puppet based on a character from Shakespeare which will be carried on the processional route. After the Birthday Celebrations the pieces will be hung in the Royal Shakespeare Theatre for the summer season. This has been enabled by funding from the Citizen’s Advice Bureau’s Reach Out And Help Partner Fund, and supported by Stratford Town Trust.